Nigeria has "rebased" its gross domestic product (GDP) data, which has pushed it above South Africa as the continent's biggest economy. Nigerian GDP now includes previously uncounted industries like telecoms, information technology, music, online sales, airlines, and film production. 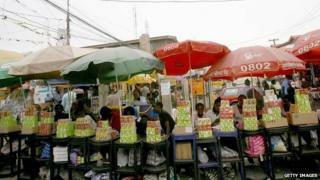 GDP for 2013 totalled 80.3 trillion naira (£307.6bn: $509.9bn), the Nigerian statistics office said. That compares with South Africa's GDP of $370.3bn at the end of 2013. However, some economists point out that Nigeria's economic output is underperforming because at 170 million people, its population is three times larger than South Africa's. On a per-capita basis, South Africa's GDP numbers are three times larger than Nigeria's. And Nigerian financial analyst Bismarck Rewane called the revisions "a vanity". He added: "The Nigerian population is not better off tomorrow because of that announcement. It doesn't put more money in the bank, more food in their stomach. It changes nothing." Rebasing is carried out so that a nation's GDP statistics give the most up-to-date picture of an economy as possible. Most countries do it at least every three years or so, but Nigeria had not updated the components in its GDP base year since 1990. Then, the country had one telecoms operator with around 300,000 phone lines. Now it has a whole mobile phone industry with tens of millions of subscribers. Likewise, 24 years ago there was only one airline, and now there are many. International aid donors are keen for more African countries to undertake this process regularly because it enables them to make better decisions when it comes to aid.